In this chapter the main state-of-the-art techniques are presented and described. There are three main groups of blending algorithms, each of them showing some benefits and drawbacks. On the one hand, transition smoothing methods minimize the visibility of the seams between two images fusing the image information of the common overlapping area. A drawback of this group of methods is that geometrical image misalignments and moving objects may cause the visualization of artifacts on the overlapping regions. On the other hand, optimal seam finding methods compute the optimal placement of the seam in order to minimize the photometric differences along the path. In the case of this group of methods, problems may appear when joining images acquired with changing illumination conditions or different time exposures. Finally, hybrid methods combine both strategies by fusing the image information around an optimally computed seam. This last group of methods allows avoiding the above mentioned problems. The chapter also proposes a classification of the methods of the literature based on their nature and capabilities. 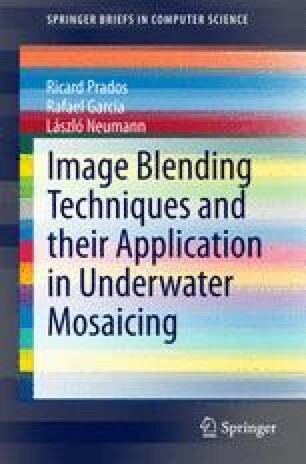 The aim of this classification is to discern the optimal strategy to blend large-scale high-resolution underwater photo-mosaics.